Liza “Hates” Alec so says everyone hates someone in this house. Tom is talking about the 9 alliance and how they need to take out Gary, Danielle, Aneal, and Suezette. Tom asks her if she’s cool with Danielle. Talla says she talks to Danielle but Talla isn’t tight with her like she is with Liza and Tom. Liza Joins them. They start talking about the Head of Household next week and how much they need to prevent Gary to win it. Talla is getting super stressed out because she knows how important it is. Liza says she’s going to fight very hard to get it she just hopes it’s mental. They chat about potential HOH competitions. 12:20am The camera operators are all over the girls behinds tonight. 12:30AM Peter and Alec Peter tells him that Liza and are willing to vote Danielle out so they have the six they need. If Alec can convince AJ they have 7 vote to protect them from someone wavering. Alec is worried about Liza he doesn’t think they can trust her. Peter tells him not to worry he’s had a small talk with her today. Alec is worried about Tom pulling Topaz over..
1:05AM Bathroom Alec and Tom Tom is worried about Emmett he tells Alec they will find out if Emmett is really true to them when they see him react after Jillian is sent home. Tom says he can’t stop thinking about scenarios. Alec agrees, they both congratulate each other for being in such good positions. Tom is thinking final 2 and he knows he shouldn’t be planning that far ahead yet. Tom knows if he sticks with Alec and Peter he’ll make it far. Alec says they need to plan for final 4 first because final 3 and 2 is too far ahead. Tom is saying how perfect it is that they have Danielle going home this week. Tom agree but he really wants Gary sent out next week. 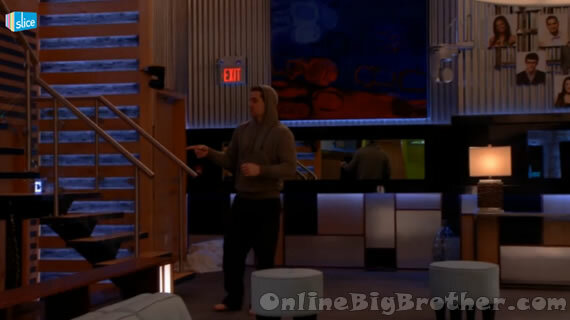 (I bet a bottle of beer Gary wins HOH.. LOL) Their conversation is broken up by production because Alec doesn’t have a microphone. Tom starts chatting about “Raising his voice” with Talla and Garry during the party. He say he was more angry at Garry than Talla. The argument was about Garry taking all the vodka ans “Slamming it” Andrew was worried that Tom was going to say something during the argument and get in trouble with production. I think Topaz and Alec’s cuddlemance is so PG and so cute! 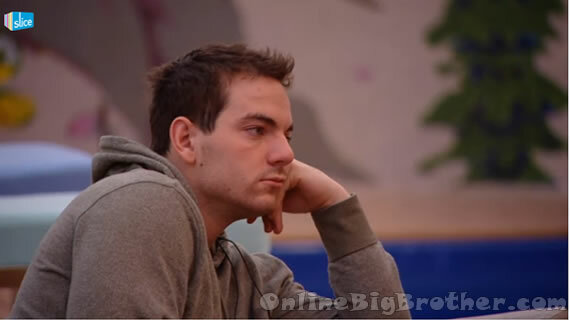 Big Brother Canada: Tom says it’s not like I was er$ct and working with it, it was just a limp di*k.